(Eastern Chipmunk (Tamias striatus) - 01) This eastern chipmunk climbed up to our roof deck to feed on the seeds that had fallen from an overhanging white pine. 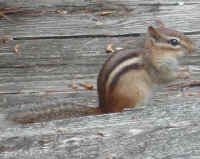 Chipmunks are small ground squirrels who usually spend their whole lives in a 1/2 acre territory that surrounds their home burrow. (Eastern Chipmunk (Tamias striatus) - 02) It is sometimes hard to realize that these cute little ground squirrels actually grow to a length of up to 11 inches from their nose to the tip of their tail. 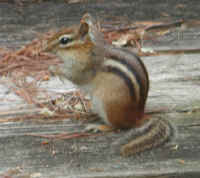 Some of the other physical characteristics of the eastern chipmunk are: their reddish-brown fur, the white or light tan stripes that run the length of the upper sides of their body with black stripes above and below, the dark stripe that runs through the eye along the side of the face with light stripes above and below, that are often white above and below the eye. (Eastern Chipmunk (Tamias striatus) - 03) Chipmunks spend most of their waking hours foraging for food to eat and to store away for winter, most of which consists of nuts and seeds. They also eat mushrooms and berries and other fruits. (Eastern Chipmunk (Tamias striatus) - 04) Eastern chipmunks usually only mate once a year and have from two to five children who emerge from their burrows at about six weeks of age. The burrows can be up to ten feet long, and are defended only for a distance of about fifty feet around, even though their territories are larger. (Eastern Chipmunk (Tamias striatus) - 05) We believe that this chipmunk lives under our front walk, but have never seen him or her at the entrance. (Eastern Chipmunk (Tamias striatus) - 06) We find wild chipmunks fascinating to watch, but they are relatively difficult to photograph, as they seem to be in almost constant motion, which blurs the image and causes us to dump most of the photos we take (an advantage of digital cameras). (Eastern Chipmunk (Tamias striatus) - 07) One of the primary reasons we live where we do, is because we receive daily blessings from God's other creatures who live around us. 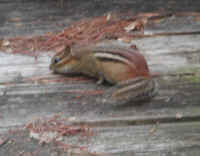 The visits from this chipmunk are just one of them. Our hope and prayer is that all other humans would learn to live in peace with all of God's children (human and non-human), and if we did, perhaps the animals would, too. (Eastern Chipmunk (Tamias striatus) - 08) Over the winter, one of the deck pallet boards came loose, and as it dried, it warped and curled upward, providing a convenient place for the chipmunk to duck into. Shortly after taking these photos, it rained for several days in a row and the board went back down closing up this get-away entrance.